Tokyo Otaku Mode’s Exclusive Sword Art Online Merchandise Collection Part II: Sword Art Online Computer Glasses Enhanced with the Power of the Greatest Weapons! Feel invincible with Kirito’s Elucidator and Dark Repulser, Asuna’s Lambent Light, and Sinon’s Hecate II protecting your vision! Enhanced with the Power of the Greatest Weapons! Part II of the Sword Art Online x Tokyo Otaku Mode Merchandise Collection is all about the most awesome weapons in the series. While a great variety of products based on the series is currently available, it is difficult to find ones that are designed after SAO weapons and are able to display them in a tangible 3D format. 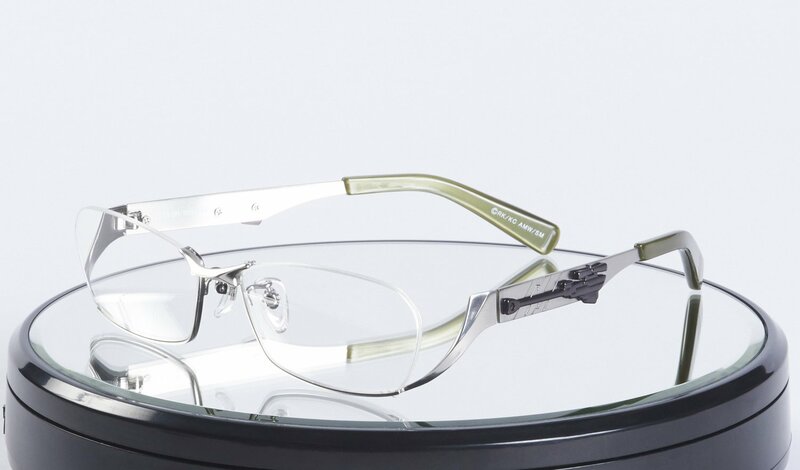 Tokyo Otaku Mode is proud to present not one, but three pairs of weapon-based computer glasses that are fashionable, practical, and true to the weapons. 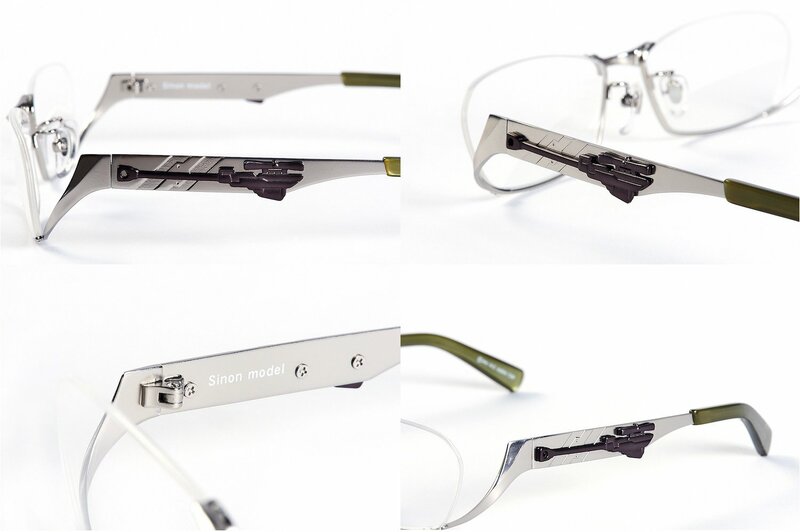 We focused on naturally incorporating the weapons into each design, upgrading the stylishness of each design by choosing the best modern frames in Japan, and maximizing comfort by adjusting the weight, temple length, and other parts of the computer glasses. Every pair comes equipped with blue light blocking lenses that are ideal for those who use computers and other digital devices for extended periods of time. Of course, the lenses can be exchanged at your local store or optometrist based on your specific needs, and you can use them like regular glasses. 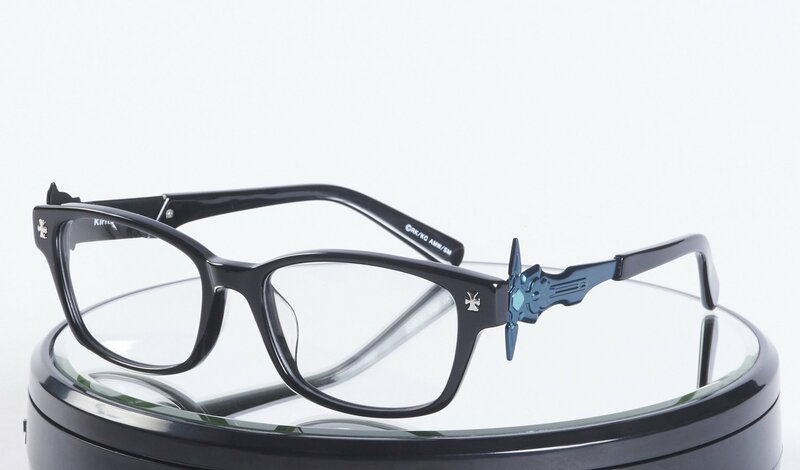 These Sword Art Online Computer Glasses are “enhanced” with the power of the greatest weapons. Feel invincible with Kirito’s Elucidator and Dark Repulser, Asuna’s Lambent Light, and Sinon’s Hecate II protecting your vision! 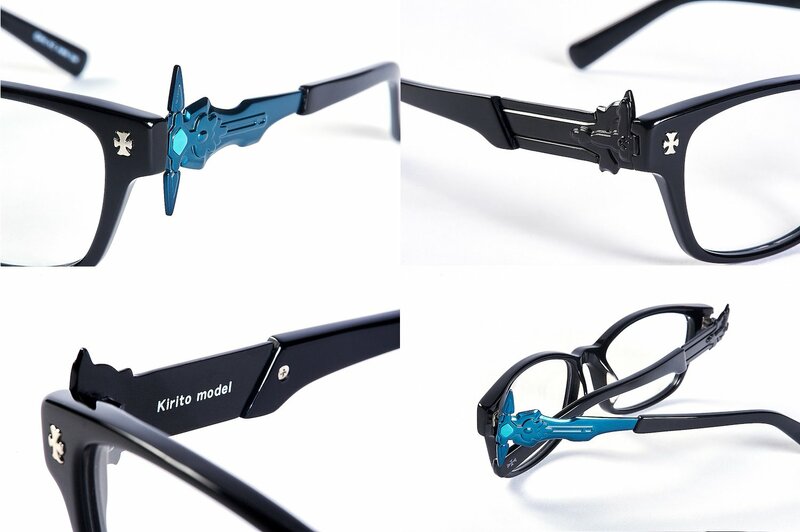 The Kirito Model is presented in a smart Wellington frame that is equipped with his trademark weapons: the Elucidator and the Dark Repulser. Naturally, the model is coated in black, which contrasts wonderfully with the aqua from the Dark Repulser equipped on the left temple. Also, a motif from Kirito’s Black Knight outfit has been added in silver to the end pieces on the left and right, bringing the design of this model even closer to Kirito’s image. The accurate representation of the form and the colors of Kirito’s asymmetrical dual blade style make this model perfect for Kirito fans. Although the design is asymmetrical, it has been adjusted to ensure that users will not feel any discomfort or unbalanced weight distribution during use. The Kirito Model will be accompanied by a luxurious cleaning cloth featuring Kirito’s silhouette, and both can be stored inside a black case that matches Kirito’s image. Drag to rotate the image. The Asuna Model is based on the Lambent Light, her weapon of choice in the Aincrad arc. To accentuate the elegance of her rapier, we made the temples as thin as we possibly could and installed an enamel jewel in the guard. Our efforts and focus on the model’s shape resulted in temples that look just like a rapier and a scabbard from each side. 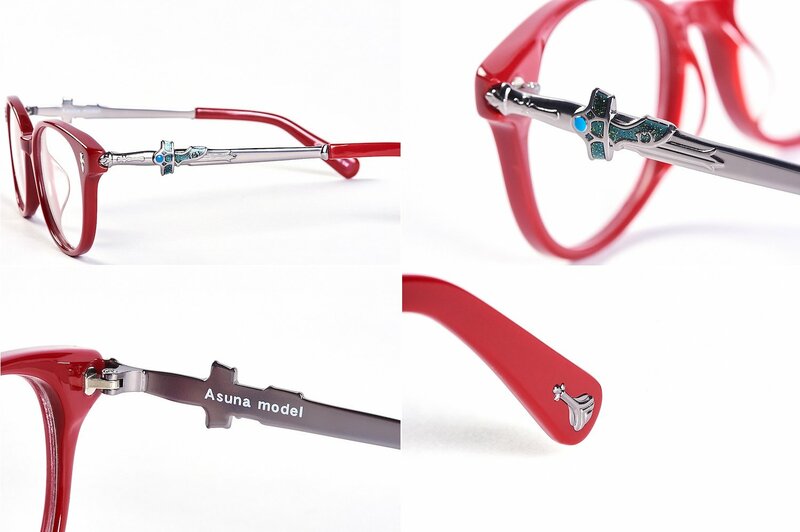 A slightly rounded Boslington frame was chosen for the Asuna Model. Like the Kirito Model, a motif from Asuna’s Knights of the Blood guild outfit is featured in silver on the end pieces, which allow the two models to match. 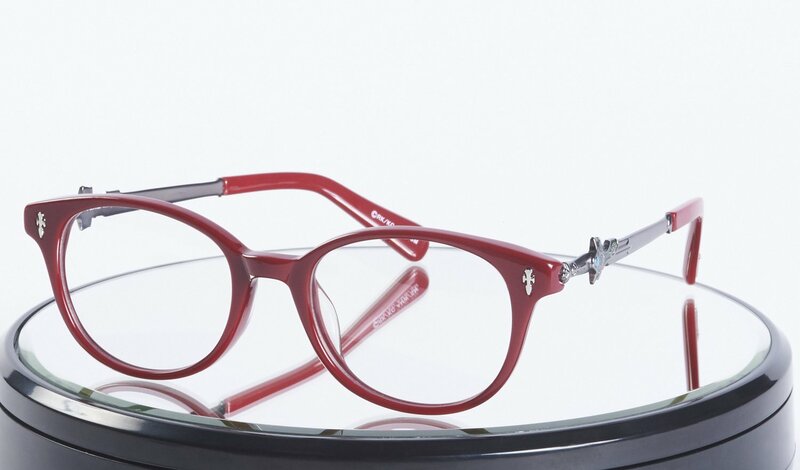 The serene red coating based on Asuna’s rapier and scabbard makes this model an excellent choice for both men and women. 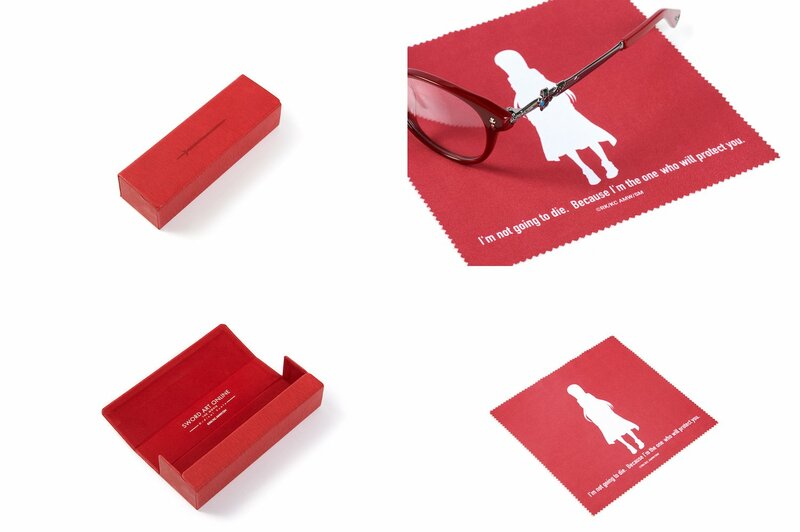 The Asuna Model will be delivered with a red case that matches her image together with a luxurious cleaning cloth that features her silhouette. The Sinon Model is locked and loaded with Sinon’s Hecate II that served her well in Gun Gale Online of the Phantom Bullet arc. The barrel, the scope, the stock, and all the finest details of the metallic Hecate II have been replicated and presented in this model. The colors were chosen to match Sinon’s outfit in the Phantom Bullet arc, and also to make the computer glasses match easily with just about any outfit that users may wear. 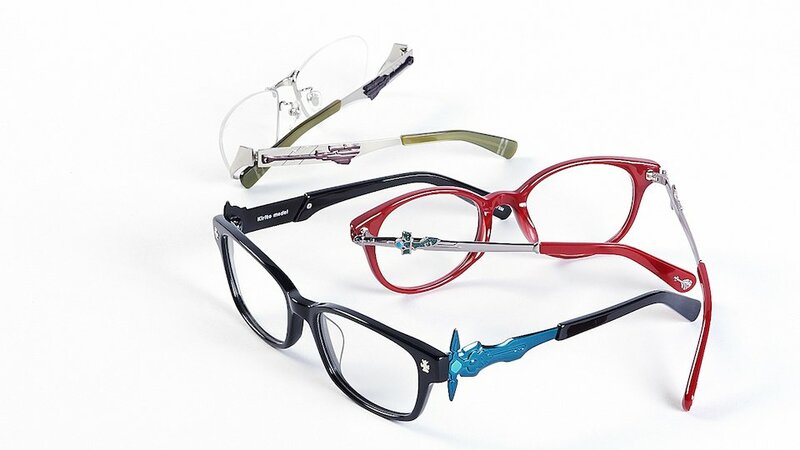 The model features trendy under-rim style frame with a butterfly-like square shape. While the Sinon Model may look rather simple from the front, the Hecate II shining on each side, the laser-engraved temples, and the end piece motifs certainly pack a powerful punch. The Sinon Model will be delivered in a vivid blue case that matches the color of Sinon’s hair along with a luxurious cleaning cloth that features her silhouette. 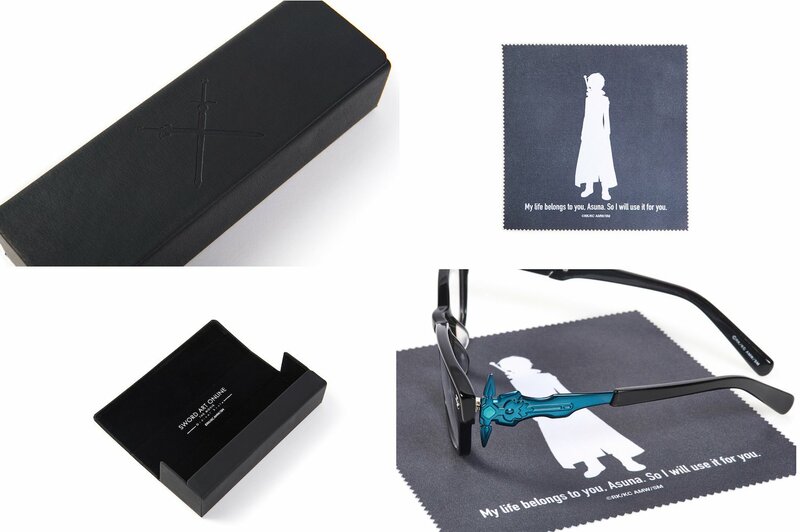 The Sword Art Online Computer Glasses contain everything that fans need. Wear them, and let each weapon protect you while you work, study, and play. Based on Reki Kawahara’s original light novel series, the Sword Art Online anime series illustrates Kirito The Black Knight’s heroic saga that unfolds in “Sword Art Online”, a futuristic virtual reality game. Over twenty million copies of Sword Art Online light novels have been sold worldwide, and the series has been adapted into a variety of media formats, such as anime, games, and comics. In 2017, its film based on an original story by Kawahara titled “Sword Art Online The Movie: Ordinal Scale” opened in theatres, crossing borders and gaining tremendous popularity worldwide. As the official international media partner of Sword Art Online, Tokyo Otaku Mode has continued to share information about the series with fans around the world since November 2016. We have experience collaborating with numerous manufacturers to produce merchandise based on a variety of different series, and this time, we were truly inspired by the voices of all you SAO fans. 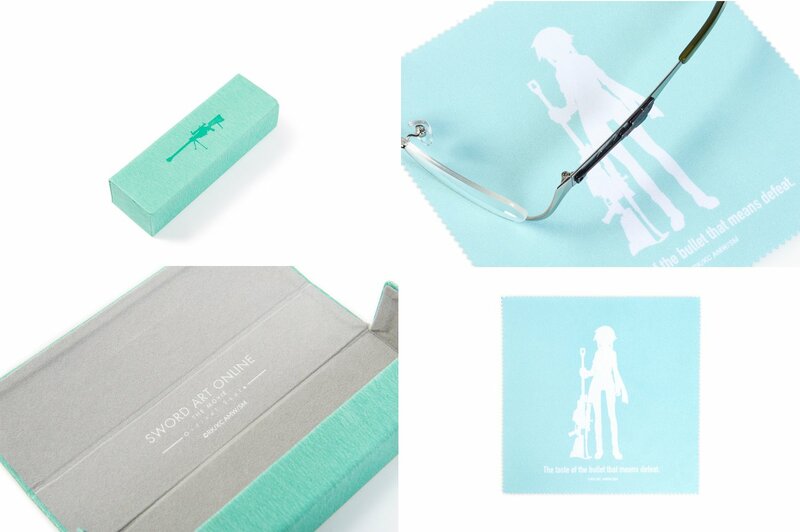 Your feedback and requests motivated us to produce SAO merchandise unlike anything that has been made before. Through this Sword Art Online × Tokyo Otaku Mode project, we will produce an exclusive Sword Art Online merchandise collection that truly captures the essence of the series. Please keep the product away from heat and other metals to prevent damage. Plastic lenses may break upon heavy impact. Please refrain from using the product while playing sports or during activities that may damage the product to prevent injuries. Please refrain from using this product in crowded areas to prevent its parts from being caught on straps, strings, or other potentially dangerous items. Please refrain from staring at the sun or other strong sources of light, such as the light emitted from welding. The coating on the product may peel off or change color when in contact with sweat, hair styling products, and other liquids or gels. Usage of the product without its original coating may lead to allergic reactions. Q: Will these computer glasses come with prescription lenses? A: The lenses of the Sword Art Online Weapon-Based Computer Glasses are designed to protect your eyes from blue light. They are not corrective lenses for nearsightedness or other eye conditions. To change the lenses to prescription lenses, please contact your local glasses store or optometrist for more details. A: Products are scheduled to be shipped out in December 2017. A: Products will be shipped directly from Tokyo Otaku Mode in Japan. A: Please ensure that you have filled out your payment method and shipping information and try again. Instructions are available here. 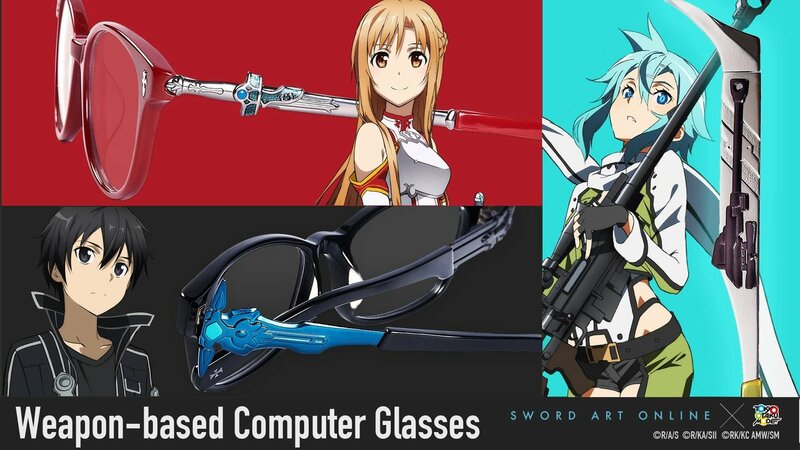 SAO Weapon-based Computer Glasses are now on the Tokyo Otaku Mode Shop! Now accepting JCB credit card payments! The cleaning cloth designs have been finalized! SAO x TOM Computer Glasses to be displayed at Animegane! SAO x TOM Merchandise Collection to be displayed at Anime Expo!